It has been over 17 days since the southwest monsoon season commenced in India, but the monsoon is facing difficulties in progressing. Ideally, by this time (middle of June), the monsoon should have covered areas till north-central India. This time, it hasn’t even reached central India! The Arabian Sea branch of the monsoon has been stalled since June 10, thus disappointing those who have been anxiously waiting for the monsoon rains. The northern boundary of the Arabian Sea branch of monsoon continues to pass through Karnataka and Andhra Pradesh. But, as per the expectation, the Bay of Bengal branch of the monsoon made a rapid progress on June 14. After a gap of three days, it further progressed on June 17 and now covers entire northeastern states of India, most of West Bengal and some parts of Bihar, Jharkhand, Odisha and coastal Andhra Pradesh. The negative impacts of sluggish monsoon have started surfacing. Between June 1 and 16, India has received 50.3 mm rainfall as against the normal of 67.1 mm. There is a strong rainfall departure of -25 per cent, which means India has got deficient rainfall in this period. As can be seen in the below image, out of 36 meteorological subdivisions, 15 have received deficient rainfall whereas five have received scanty rainfall in this period. Eleven subdivisions have received normal rainfall but there are only five subdivisions that have received excess rainfall. These five subdivisions are—Northern Interior Karnataka, Rayalaseema, Coastal Andhra Pradesh, Himachal Pradesh and Haryana-Chandigarh-Delhi. 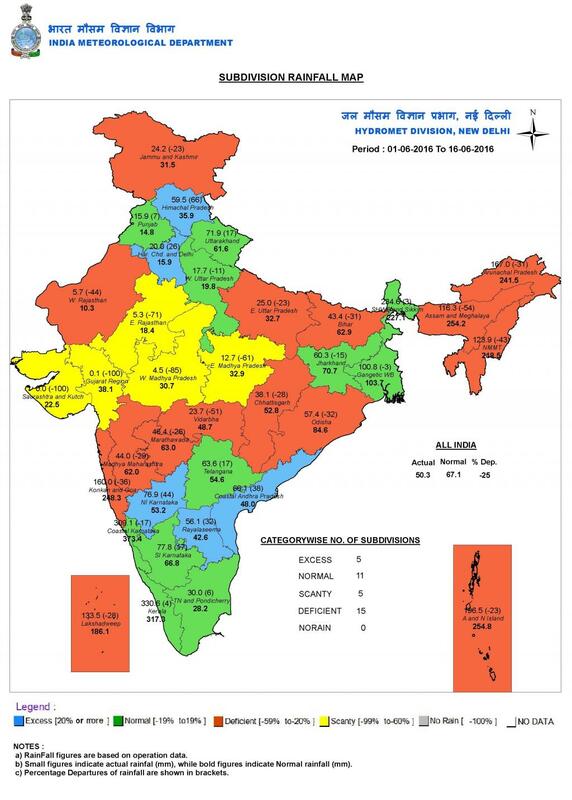 However, it needs to be remembered that monsoon is yet to make progress in northern interior Karnataka, much of Coastal Andhra Pradesh, Himachal Pradesh and Haryana-Chandigarh-Delhi. So, the excess rainfall in northern interior Karnataka and Coastal Andhra Pradesh is the pre-monsoon shower, whereas in Himachal Pradesh and Haryana-Chandigarh-Delhi, it’s due to western disturbance. The latter has no connection with the monsoon. Country’s water reservoirs, especially the 91 major ones, are eagerly waiting for strong rainfall events to bring a considerable improvement in the water levels. At present, total water storage available in these 91 reservoirs is just 15 per cent of total storage capacity. Last year, it was as high as 57 per cent. The respective storages across different regions of India are below 25 per cent. While northern region has around 23 per cent of its total capacity, it is 20 per cent in central region, 17 per cent in eastern region, 11 per cent in western region and just 9 per cent in southern region. More details of these levels can be found here. Delayed monsoon, coupled with low water levels, has started impacting the kharif sowing season in states like Maharashtra where live water storage was just 9 per cent (as of June 15, 2016). In Marathwada, it continues to be around 1 per cent only! Although the sowing window will be open for some more days, for farmers, proper sowing is becoming like a race against the time. Farmers in several regions of Maharashtra have already started sowing. This was mainly because of pre-monsoon showers and misleading news regarding arrival of monsoon. As the soil moisture is still not sufficient, these farmers have landed in trouble. The sown seeds have either been damaged or they are on the verge of being damaged. The farmers will have to go for sowing again, particularly in the non-irrigated areas. To forestall further losses, the Agricultural Meteorology division of IMD and Chief Minister of Maharashtra have asked the farmers to delay sowing until the onset of monsoon. There is a cyclonic circulation (region of anti-clockwise winds indicating lower air pressure than surrounding) in the Bay of Bengal near Andhra Pradesh-Odisha coast. As per the weather models, it will move inwards in India and reach Chhattisgarh, eastern Maharashtra and northern Telangana by Monday, June 20. As a result of the influence of this circulation, rains are expected in parts of Odisha and Chhattisgarh till June 20. Rains are also expected in Maharashtra, Telangana and northern Karnataka from June 18 to 21. Drought-hit Marathwada region of Maharashtra will get light to moderate rainfall in this period, whereas Vidarbha will get light rainfall and parts of Nashik and Pune divisions will get light to moderate rainfall. Telangana and northern Karnataka will get moderate rain in this period. Rainfall is also expected to begin in Mumbai from June 18. This rainfall is likely to benefit farmers to some extent as it will create favourable conditions for sowing, particularly in areas where there were strong pre-monsoon showers in the past. But in other areas such as Vidarbha, which is having poor soil moisture and high temperatures, this rainfall won’t be sufficient for creating favourable conditions for sowing. Farmers of this region must delay sowing for some more days. The below map shows winds at an altitude of 5,000 feet above ground on June 20. Dotted circular region indicates areas where IMD is planning to declare monsoon’s arrival in spite of unfavourable conditions. Due to this circulation, the monsoon will advance to remaining parts of Karnataka, Goa and South Konkan by June 20. In fact, they have been getting good rainfall since last some days. As per latest update of IMD, “Conditions are favourable for further advance of southwest monsoon into remaining parts of central Arabian Sea and entire Konkan and Goa, some parts of central Maharashtra, Marathwada, Vidarbha, Chhattisgarh and East Madhya Pradesh, remaining parts of North Interior Karnataka, Coastal Andhra Pradesh, Odisha and Gangetic West Bengal, entire Telangana and some more parts of Jharkhand and Bihar during next 2—3 days”. Meteograms—weather plots showing location-specific weather conditions— of various cities such as Hyderabad, Vijayawada, Pune, Nagpur and Mumbai don’t show presence of deep-layered westerly or south-westerly winds at least till June 23. For declaration of monsoon’s arrival in a region, this parameter can’t be overlooked. 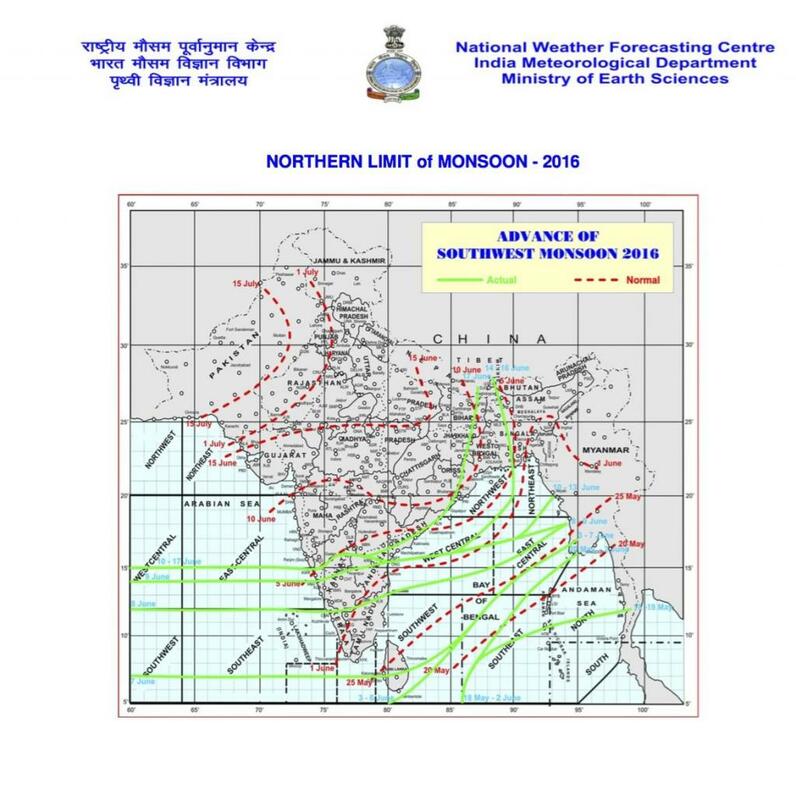 Even IMD’s weather model (see above image) doesn’t show monsoon-like atmospheric conditions in these areas till June 23. An arrow in the circled region indicates the direction of winds on June 20 which would be from north-west and not west or south-west. Hence, it looks like IMD is in a hurry to declare monsoon’s arrival in Central India. Kerala had been receiving good amount of rainfall since June 1, but just because of this wind parameter, onset of monsoon in the region wasn’t declared till June 8. This forces us to think whether declaration of monsoon’s arrival in India is a subjective choice. Proper monsoon winds will establish over Central India only after June 24. Hence, Gujarat and Madhya Pradesh won’t be experiencing monsoon at least till June 23. 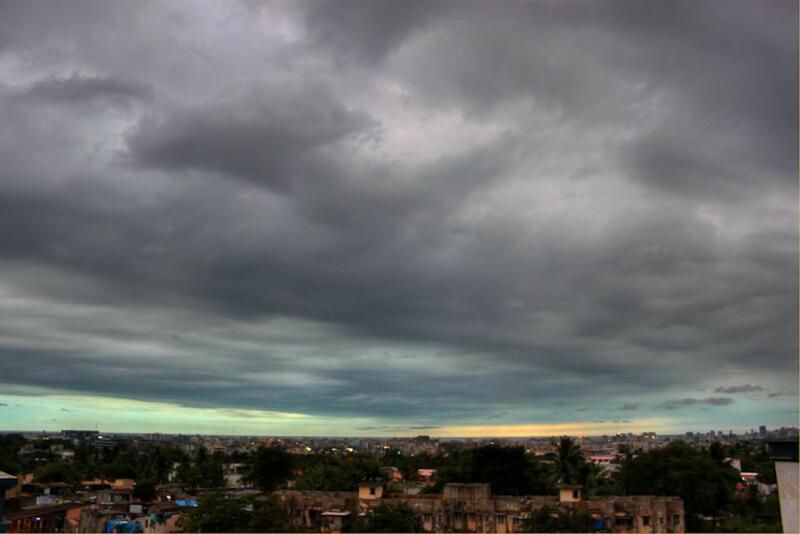 It’s unlikely that the monsoon will advance over the plains of North India at least till June 25. So, the wait will continue.